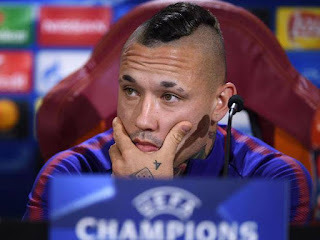 Many believe this season might be Nainggolan last season at As Roma but the Belgian has revealed why he can't join Chelsea and why he can't leave Roma. The Roma Midfielder almost sighed for Chelsea in both 2015 and 2016 but he opted to stay in Roma. Nainnggolan is valued at £45million and Manchester United are also considering a move for the highly-rated midfielder. Though many believe he might leave Roma because he is yet to win any silverware with the club. Neinggolan still has a strong bond with the club and he doesn't see himself starting life again in another part of the world. "People seem to have written something about me every day for the past ten years, but I'm still here. Let them talk." "I have a very good life here. I have everything I need. My family lives here, so everything is on a good level for me." "Chelsea? Yes, that was something. It wasn't done, but they were interested in me. Last season, when they won the Premier League, it was the beginning of that season. But at the end of the day, the choice wasn't that difficult for me." "I like English football, I love to watch the English games too, but I'm almost 30 now. Starting over again? It's difficult to even to think about that. And I hate the rain. We were in Liverpool for two days and it didn't stop raining. It was cold too. You see the difference to here?" How high can you rate Nainggolan in Midfield?